Prolific director Ken Russell (Tommy, Lisztomania, The Devils, Altered States) made his third feature film Women in Love in 1969 (the year it was released in the U.K.) with a terrific cast, starring the infamous Oliver Reed, as well as Alan Bates, Glenda Jackson, and Jennie Linden. The film was nominated for a number of prestigious awards, including several Oscars and BAFTAs; Jackson won the Academy Award for Best Actress in 1971. Based off of the novel by D.H. Lawrence, Women in Love is the story of gender and class battles in post-WWI industrialist Britain. The film follows a pair of independent women and sisters as they fall in love and navigate life's rocky emotions. Elementary school teacher and sister Ursula (Linden) falls in love with wealthy school inspector Rupert (Bates) as sister and sculptor Gudrun (Jackson) falls in with the sometimes cruel, strong-willed mining company heir Gerald (Reed). Between the upper crust philosophizing in tony settings, there are some absolutely gorgeous images and genuinely shocking scenes; at times not mutally exclusive. I don't want to spoil the film if you haven't seen it, so just enjoy the ride. I will say that the scene in which Reed charges his horse at a train in a fit of suicidal madness is quite hard to watch, especially if you love animals (or have empathy for living creatures whatsoever). Cinematography on Women in Love by Billy Williams is fantastic, and I'm pleased to say that Criterion's disc --- with a fabulous restoration from the British Film Institute --- does the work justice. The colors are drop-deap gorgeous and the picture is pristine as can be. The sound is quite lovely, too. 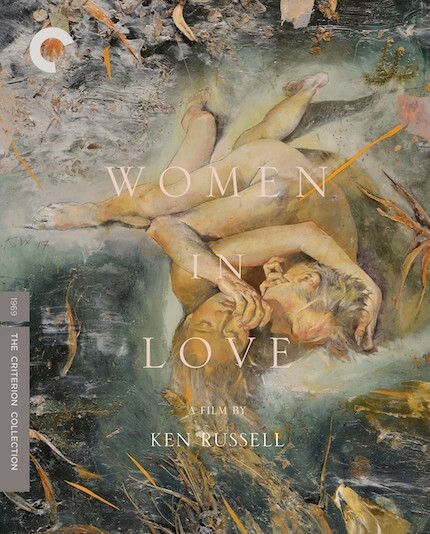 Kudos to both the BFI and Criterion on this release, which Russell fans must own. The special features include Russell's own documentary on his life, a tongue-in-cheek film packed with dry humor with a child (one of Russell's children, I believe) acting as himself. There's also a great interview with DP Williams, an illuminating look into the making of the film, which will be of much interest to filmmakers. Williams also talks about the naked wrestling scene between Reed and Bates lit by fire light in the interview --- including how he recreated the scene for some pickup inserts. The effect is seamless. Are you a Ken Russell fan? You can see a clip and images, and read more on Criterion's release here.